Once upon a time, carpenters and woodworkers relied on a manual miter box and backsaw to cut nearly all miters and angles needed in their work. This all changed when portable power tools began to take the building trades by storm. Today, all but the finest craftspeople or purists rely mostly on power miter saws (chop saws) for making most of their angled cuts. But there is still a perfectly good place for a manual miter box and back saw, especially if you are a casual DIYer who only rarely cuts a miter. Manual miter boxes come in several levels of sophistication. At the low end, a manual miter box can be a simple box made of wood or plastic, in which there are several predetermined cutting slots set at common miter angles—such as 45 degrees, 22 1/2 degrees, and 60 degrees. 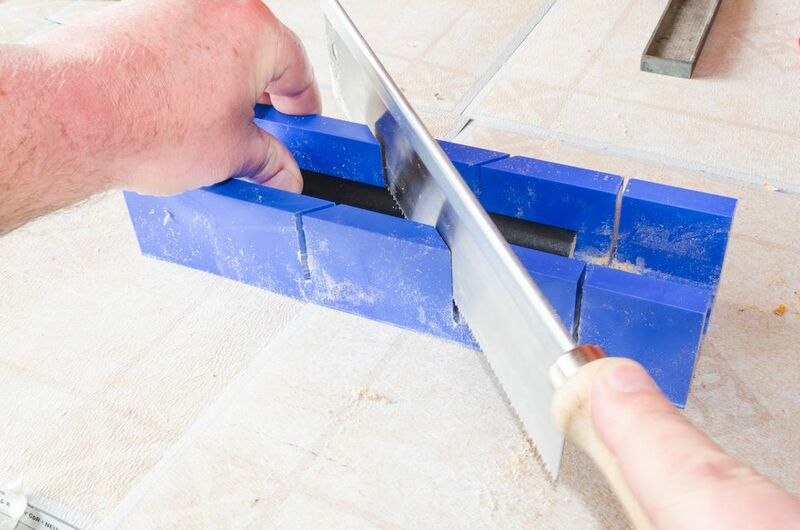 Pairing this simple box with a specialty handsaw known as a miter saw or backsaw (named for the reinforced spine that holds the blade rigid during cutting), and you'll be able to cut the most common angles needed for simple jobs such as installing wood trim moldings or baseboards. At the higher end are all-metal manual boxes with beds that variably adjust to almost any angle you want to cut. These saws often have brackets that hold the saw blade perfectly vertical during cutting. They are excellent choices for fine craft work, such as picture framing or cabinetry work. Low cost. A manual miter box with a backsaw costs between $10 and $40. For casual DIYers who cut miters only occasionally, this may be a better option than a more expensive power miter saw. Smoother cuts. Most DIYers equip power miter saws with general-purpose blades suitable for cutting all type of lumber, including framing lumber. These blades cut fast but they cut roughly. A manual backsaw, on the other hand, has fine teeth that are excellent for cutting fine moldings without chipping or roughness. Greater precision. Power miter saw often lose their alignment. Manual miter boxes and backsaws can cut with greater precision, making them especially good for fine craftwork, such as creating picture frames. Don't cut large lumber pieces, such as 2x framing lumber, in a manual miter box. The fine teeth on a backsaw will take a long time to cut framing lumber. Instead, use an ordinary crosscut hand saw or power circular saw to cut framing lumber. Reserve the manual miter box for cutting trim. For cutting crown moldings and other shaped pieces, use a manual miter box with a clamping feature to hold the workpiece steady. It is essential that the workpiece is held steady during cutting. Backsaws cut on the pull stroke. Use light downward pressure as you draw the saw toward you, but release the pressure when returning the saw back to the forward position for the next stroke. Sharpen the blade regularly. Backsaws need to be very sharp to cut accurately, so have yours resharpened frequently—or replace the saw when it becomes dull.